Pictured from left are honoree Ralph Martin, Post 201 Commander Dennis Turner and honoree Virlyn Asherbranner. 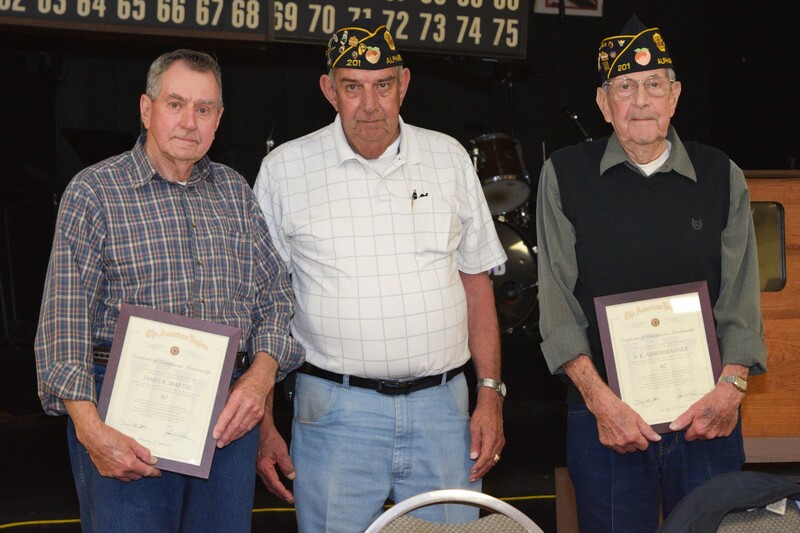 MILTON, Ga. — Two Milton men were honored by the National American Legion Headquarters for their 60 years of active membership. Virlyn Asherbranner and Ralph Martin were honored at the March 15 general membership meet of Alpharetta American Legion Post 201 with framed commendations from the American Legion’s National Commander. Asherbranner, A Korean War Veteran and retired Air Force Chief Master Sergeant with 32 years of service was a past vice commander at the legion and served as chairman of the building committee for the current post facility when it was constructed in 1967. Also recognized for six decades of membership in the American Legion was Ralph Martin, another veteran of the Korean War. When in service, he was a member of the US Army. Among his American Legion leadership posts was that of past commander at the Wills Road facility. The American Legion is the nation’s largest veterans’ organization with 2.7 million war time veteran members. Above is a photo from the installation of a brick on October 22, 2014 in the Walk of Memories at Post 201. The brick was for Ed Carroll who was one of the founding members of Chapter 576 Military Order of the Purple Heart whose meeting's are held at Post 201 on the 3rd Wednesday of each month at 7 PM. Ed was a retired Army Col. who served in both Korean and Vietnam and was a flight instructor on rotary wing aircraft. May he rest in peace. Regards Walter Swenson Commander Chapter 576 Alpharetta Ga.